How is Lansing Center Green? Lansing Center is SERF and DLEG certified, and we take environmental responsibility seriously. We are committed to an efficient recycling program and promote the proper use of renewable resources for both public and service areas. Easily accessible recycling bins are located throughout the facility. Our staff responsibly recycles various paper materials, metals, light bulbs and ballasts, cardboard, toner and plastic ware. Carpet waste from events and the facility are also included in the recycling regime. Adding to our environment-centered approach, we have developed a recycling program to divert up to 50% of its waste from landfills in order to substantially decrease the amount of waste buildup. Our waste reduction program is not limited to material goods. Food items that fit within specific health and safety guidelines are donated to Food Movers. Sponsored by the Greater Lansing Food Bank, Food Movers collects prepared and perishable food from businesses and immediately delivers the food to shelters and community kitchens where there is a need. To date, the Lansing Center has donated over 28,000 pounds - that equals about 14,000 racks of baby back ribs - to Food Movers. In order to maintain energy efficiency throughout the facility, lighting is switched off after events and working hours. To eliminate unnecessary lighting, motion detectors are installed in most offices and restrooms. Lighting fixtures feature energy efficient compact fluorescent light bulbs where possible. Exterior lighting is scheduled thus reducing the amount of energy consumed during after-hours. Reduced lighting is used during set-up and tear-down of events. Lansing Center’s generous skylight system allows for an abundance of natural lighting into the building, and reduces the amount of electrical lighting needed. Skylight and window insulation with argon gas also prevents loss of heat. We have invested $6 million into an energy management system that has reduced energy consumption by 29% and showed a decrease in carbon dioxide emissions by 28%. Energy Star appliances are often used in the facility as a means of cutting down on water usage and lowering utility costs. Based on the energy conservation tactics and strategies that Lansing Center has implemented and dutifully maintained, Honeywell International, Inc. presented the Energy Partner of the Year Award to Lansing Center management in February 2007. We have established a detailed “green cleaning” policy to ensure a healthy and environmentally friendly workplace. All cleaning products are Green Seal Certified. Our Pest Management program utilizes 100% organic materials to reduce employee and guest exposure to chemicals. Equipment purchases are also green compliant with LEED-EB Indoor Environmental Quality standards. All paper products within the facility are made of 100% recycled material, are Green Seal Certified and free of any chemical derivatives. Water efficiency is achieved by retrofitting all fixtures with low-water, hands-free devices throughout all facility restrooms. All automated systems are commissioned to ensure comfort and quality. Lansing Center’s catering services also utilize cloth linen tablecloths and napkins along with china ware instead of paper or plastic products to reduce amounts of waste. Clients who request plasticware can choose more earth-friendly, renewable options. 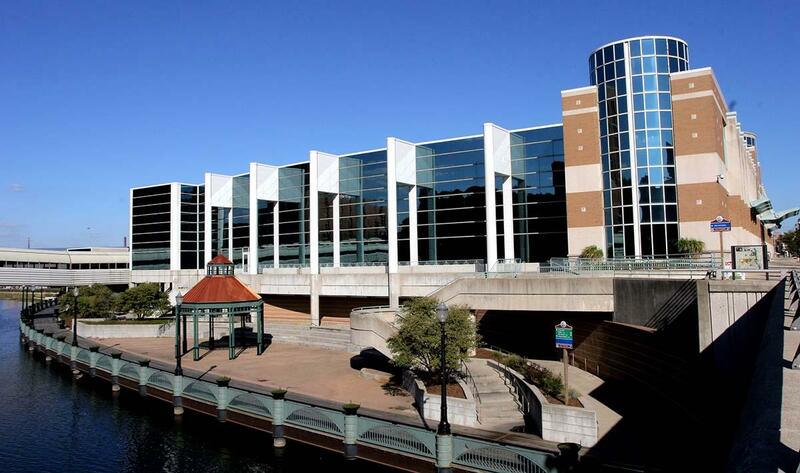 Lansing Center is located in the heart of downtown Lansing. Our location is within short walking distance to many restaurants, shops, parks and riverfront pathways. As a way of maintaining clean air and water quality while promoting natural elements in the downtown area, we use native plant species for public landscapes, have an irrigation system to reduce water waste, and provide a bike trail and bus transportation for public. We value the promotion of healthy lifestyles and appreciation of nature for residents and visitors.